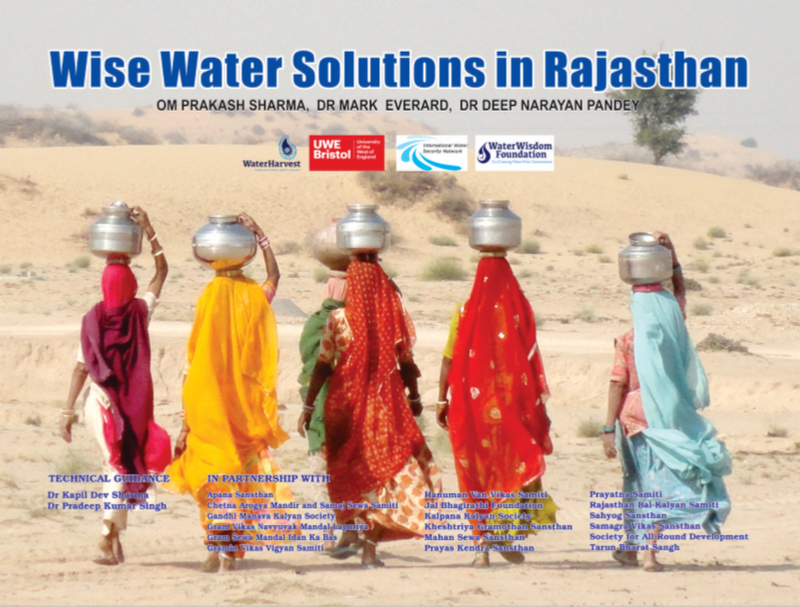 WaterHarvest (previously known as Wells for India) has published Wise Water Solutions for Rajasthan, the world’s first truly comprehensive guide to traditional water harvesting and management techniques. With support from the International Water Security Network, WaterHarvest was able to undertake the background research to create an illustrated guide to rainwater harvesting techniques appropriate for different parts of Rajasthan, and possibly also other arid and semi-arid regions of the world. Whilst new technologies can often bring great benefits, in the developing world a century of over-reliance on heavy engineering has caused many social and environmental problems. Large dams and centralised water management have often had the paradoxical impact of causing ever greater water shortages, destroying ecosystems and driving people from the land and into burgeoning cities. Discontinuation of traditional water harvesting practices in favour of mechanised extraction often negatively impacts local and regional water balances. The purpose of Wise Water Solutions in Rajasthan is to help communities identify the kinds of water harvesting solutions that match their specific geographical and cultural contexts and needs. It is designed to help people understand the wisdom, purpose, function and diversity of water harvesting systems and other wise water solutions, and to help them select those that are most appropriate and beneficial in different situations. As WaterHarvest say: “In the Aravali Hills of Rajasthan, the focus is to hold back rain water flow to allow it to percolate into the ground and thus recharge the wells. In the Thar Desert, where the water percolates straight through the sandy soil and is lost, the focus must be on water storage”. Wise water solutions, often incorporating new technologies where appropriate and connecting across scales to respond to contemporary needs yet heeding traditional water wisdom, should form the basis of sustainable water management in the modern, fast-changing world. Supported by the IWSN, the underpinning science has proven that with such knowledge, communities can work to bring water back to long-desiccated land and to long-dry stream beds. Now that the guidebook is launched, WaterHarvest, IWSN and their partners will be using it to train a new generation of water activists and practical engineers to use these traditional and often more appropriate water technologies.